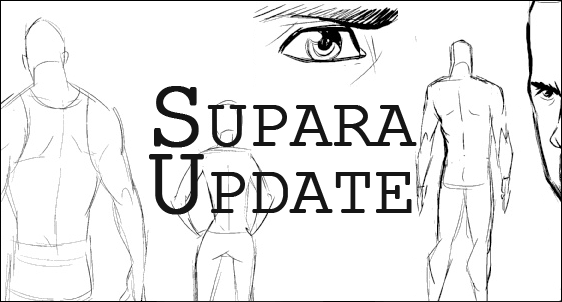 Supara Update is an occasional column/thread about anything going on regarding our first foray into the indie comic book world. One of our more active projects here at Slamfist Media is the creation of a comic book based universe called “Supara”. It’s a superhero sub-genre set within the fictional city of Supara Valley, California or commonly referred to as the Science Capital of the World. Check out the synopsis (and more) of what we have so far after the jump. “It’s 1948 in Supara Valley, CA and the U.S. Government has revealed the formation of 7 “Powers” (those born with super-human abilities) called “The Foundation” to the American Public in the attempt to stabilize the looming fear of yet another World War. This historic moment would become the first time the existence of “Powers” were living among us and immediately split the social structure. The fall of the Foundation and rise of militarized privatization merely coincided in the mid 1960’s to create a world built on indifference and greed. Our story takes place in 2013 where Supara Valley is home to most of the world’s Power-related activities; one including a series of cataclysmic incidents that will set forth a revolution that defines what makes a villain and a hero." The idea of Supara came from a group of like-minded friends wanting to create something incredible in scope. We’re in the process of writing an origin mini-series simply named “Supara: Book 1” (until further notice) therein afterward… we’ll hopefully spin each noteworthy character into their own mini-series. The premise for the entirety of this universe is to tell very human stories within fantastical situations. You may ask if this is easy. No… it’s not. In a failing market flooded with studio based work backed by major umbrella corporations… there isn't a chance to make a profit from this or at least not in print. Right now we’re working on getting the concepts of our characters drawn up by an independent artist Michael Mayne in increments of three. These will help establish the look and tone of our story since it includes 15+ characters (past/present). Every so often, we’ll post an update in regards to our work may it be writing, drawing, researching, ranting, or checking out conventions… we’re seeing this as being one of the most ambitious projects we've ever had to endure so we what you to have access to every step. You know more than anything by now but we’re complete amateurs and know next to nothing about serious business but we don’t plan on giving up anytime soon. We’ll discuss each and every hiccup and ridiculous obstacle in creative development in case you ever were to be interested in making a comic for yourself. That’s it for now but before I close this up for now… I need to know if you or maybe someone you know that would like to work for cheap with sequential artwork (comic book style art) or would like to do it for free (become a part of the creative team). Other than that… If you would like to participate in any way… may it be creating a logo, conceptual art, website design, or would like to share a little advice; we’ll be more than welcomed to it. Just leave a comment below. Thanks and until next time … excelsior? This is a blog meant for all things related to Slamfist Media’s various projects with an occasional review, editorial, and anything we deem noteworthy to fill the time. Thank you. ©2012 Slamfist Media. All rights reserved. All pictures owned by their copyright holders.. Picture Window theme. Powered by Blogger.